In trying to create a self updating script for launching reflector to update mirror lists at each startup, i caused the system to freeze at boot up. I get the following error message: “[ 2.924781] systemd: reflector.service: service lacks both ExecSart= and ExecStop= seting. Refusing. [2.936217] systemd: failed to isolate defaut target: unit reflector.service has a bad unit file setting. [!!!] failed to isolate default target, freezing. Its a question of deleting the file i created but I need to get to usr/system to do so, any ideas? 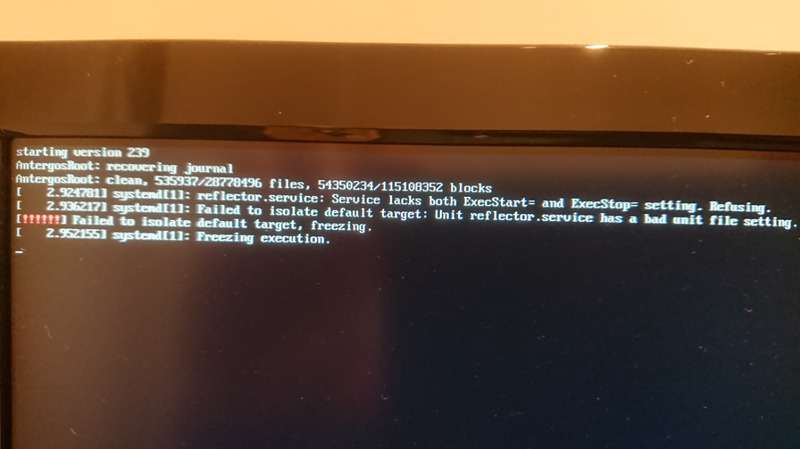 Boot from liveiso and arch-chroot into system, disable service and reboot. I guess I need to mount & chroot dev/sda2? @philipmirabelli nice to see you happy!